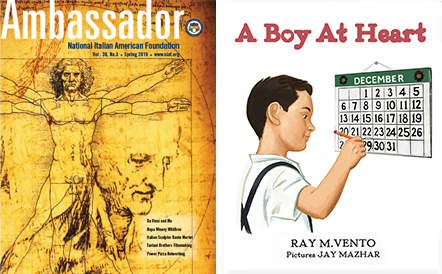 In his new children’s book, A Boy At Heart, Ray Vento tells a story that, in some way, relates to all of us. The latest in Vento’s Sam Caruso Series about the life of a young boy and his adventures, this tory focuses how to respond to the troubles and expectations of growing-up. Young Sam Caruso is turning 8 years old and he eagerly awaits the arrival of Aunt Nancy, his favorite aunt who always fives “the best presents.” Reading Sam’s story will make adults reminisce about their own childhoods and favorite relatives and that’s a testament to the author’s storytelling. Vento is an Italian American author from New York City who writes stories from his own boyhood, what he refers to as his “golden years of childhood.” His simple, descriptive style leaves young readers intrigued and turning pages to see what happens to Sam next. Just as important are the childhood lessons Vento embeds in his books; they’re positive, practical, enlightening and applicable to all children.